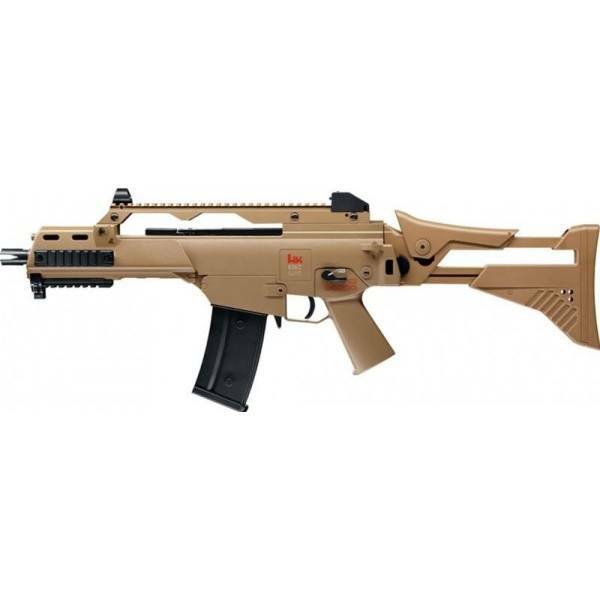 The HK G36C IDZ is the perfect gun for novice and experienced alike. This gun is very light and it's compact size makes extremely maneuverable. The IDZ is a version of the G36 model that is part of the German Army Future Soldier proposal. As a licensed product by HK itself, it bears full realistic HK markings on the receiver. The G36C is the most compact version of the G36 family with a shortened front set. The carry handle has a full length Picatinny rail that can accept various tactical accessories. It also carries the open sights. The model has a folding stock that reduces its total length and can be transported with great ease. What makes it a real IDZ model is the retractable function for the stock. On the handguard, there are three Picatinny rail segments that allow the attachement of tactical accessories, like lights, grips and lasers. The model sports aDual Power system, running on a bettery like a standard AEG and when you run out of juice, you can manualy work the piston and spring. The model has an adjustable Hop Up system to aid range and accuracy. The magazine is a high capacity one, that carries 400 6mm BBs. The package includes an 7.2V battery and charger.